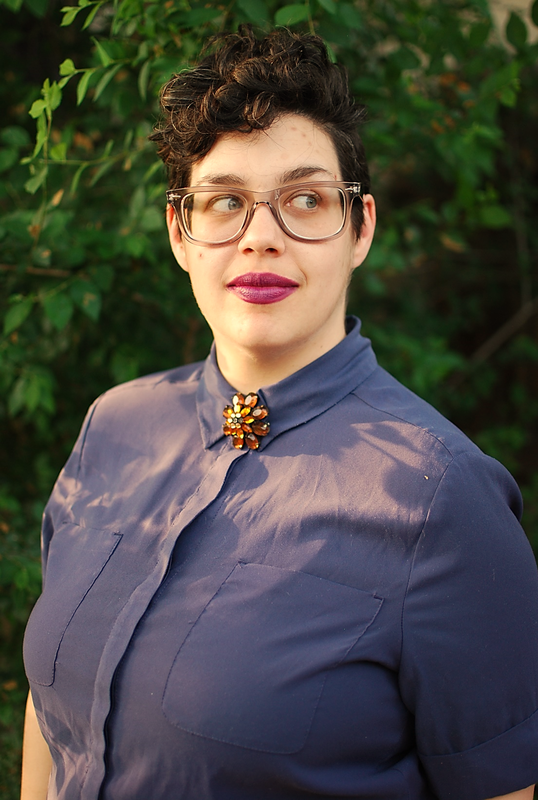 B R Sanders is a white, genderqueer writer who lives and works in Denver, CO, with their family and two cats. Outside of writing, B has worked as a research psychologist, a labor organizer and a K-12 public education data specialist. I identify as genderqueer, which for me means I do not comfortably reside on either side of the gender binary. I use the singular ‘they’ to refer to myself because of this and respectfully request you do the same in reference to me. My personal story is very much one of working class kid makes good. I grew up in Channelview, Texas, a town of low prospects built in the shadows of chemical plants and oil refineries. I was raised in an unstable home; a crucible of Tennessee Williams-style alcoholism and unchecked mental health problems which revealed me to be one of those lucky children with enough academic talent and resilience to have a fighting chance of breaking free. And I did: I gathered up my scholarships, slapped inadequate band-aids on my emotional wounds, and struck out for college. The silver lining of my childhood was that both my parents were voracious readers, and that the abundance of secondhand books in our house awakened the voracious reader in me. Fiction – especially science fiction or fantasy – was a welcome and intriguing escape. I attended Oberlin College, where I earned a B.A. in Psychology and Law and Society with a minor in Religion. I graduated Phi Beta Kappa, and received highest honors in psychology for an honors theses exploring how political beliefs shape people’s perceptions of what social power is, what can be achieved by it, and who can wield it. At Oberlin, my political consciousness crystallized, and I fell heavily into the loving arms of socialism. And in the meantime, I kept reading. In 2006, immediately after finishing at Oberlin, I started a Ph.D. program at the University of Michigan with the psychology department. I continued researching social power. My research program focused on the intersecting nature of race and class in the academy. I did well in academia – snagged a prestigious NSF fellowship, published five scholarly articles including two chapters of my dissertation, and excelled in teaching. But the ivory tower is not easily scaled by a poor kid with little family support, and it became increasingly clear to me this was not a world I would ever feel comfortable in. I ended up throwing myself into union organizing with a passion, and by the end of my academic career I worked full time as a labor organizer for AFT Michigan with K-12 teachers in Detroit. Somewhere along the way in graduate school, reading fiction was not quite enough. I started writing it, too. First I wrote with my partner, helping him edit his stuff and contributing a little here and there myself. And then I wrote more and more on my own. Within a couple of years a day felt hollow and wasted if I hadn’t written anything. Writing became a fundamental part of my life: even when I had a baby, and even when severe post-partum anxiety blindsided me and drove me nearly crazy, I still wrote every day. Writing brought me a clarity and a peace with myself which had hitherto eluded me. I defended my dissertation, went on the job market, and scored another prestigious fellowship, this one a placement as an analyst with Denver Public Schools where I currently work. I love my work, and I love that it gives me ample time to write in my off hours (since there are off hours – a lovely departure from both labor organizing and graduate school). I spend my days playing with numbers and my nights playing with words, and I could not be happier. I write in a created fantasy universe I refer to as Aerdh. Aerdh has magic, and it has elves, but mostly Aerdh has space to explore the boundaries of social identities and their intersections. I write character-driven fiction which resonates with me: I write about those on the margins, I write queer love stories, and I write about revolutions large and small.